Missed a couple of entries. Sorry about that. Been having quite a bit of fun lately, although hours are long. Thinking on the bright side, I’ve got about another 2 more weeks to go before the show wraps. Time really flies! My first time having body paint on my face. I think I look like a warrior!! 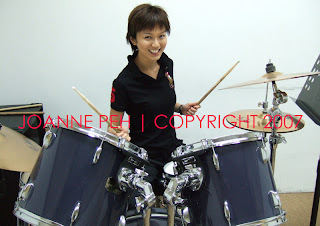 Today after work, I went to a music school to learn how to play the drum set for my new drama. Actually, the scene required me to vent my frustration, so anyhow whack also can. *heehee* It’s my first time playing the drum set cos’ I had some trouble coordinating the foot and hand work! So clumsy!! Still, I had fun! And it reminded me of those days when I used to take piano lessons at a music school. If only I have time…I would like to pick up classical piano again. It’s how we have to dress in order to visit someone in the ICU. Part of my new drama. Some of you commented that I looked bothered at the roadshow today. Thank you for your concern, ok, I confess, I was very tired. My day started at 5am this morning and I only slept at about 1am. Then at the hospital, it was a typical crying scene. So if I didn’t look my best, it’s due purely to fatigue. Nonetheless, it was good to see everyone and my apologies if I didn’t manage to sign for and shake hands with everyone, cos’ the venue was too congested and I was quite disoriented. Hope we’ll get another chance to some other time. Now time to sleep. Another long day tomorrow. P.S. A big hug to all who came for me today! Love ya! 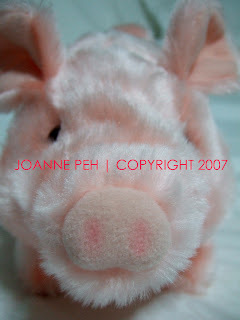 2 weeks ago i was filming at Toy’s’rus at Vivocity and saw this adorable battery-operated piggy. 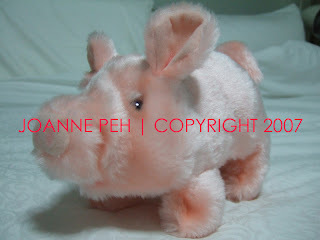 When you turn it on, it will walk towards you, stop, wiggle its nose and snort. It makes me smile because it’s sooooo cute!!! Went to shoot for iWeekly today. It’s a small feature featuring some exercises you can do. I’m not sure which issue it’ll be coming out. Heard it’s probably in 2 weeks time.